Teton Tenkara: One Hour -- I needed to get out! One Hour -- I needed to get out! After having surgery a few weeks ago I have been relatively confined to my house. It's sort of like being on home arrest but without the legal implications. Still, with all that sitting around I've been going a little stir crazy. So yesterday I was feeling pretty good and I decided to drive up into the mountains near my house for a sortie. I took with me my Tenryu TF39TA, a few flies, and a couple lines. I walked carefully down the stream side trail looking around and enjoying the scenery. After a few minutes I came to a section of the stream without beaver ponds and I decided to fish for a few minutes. The water was low and clear and there was an annoying breeze, making casting among the willows a challenge. I used a #12 light wire hook kebari, subsurface. I could have used a dry fly, the water being so shallow, but where's the challenge in that? The fly after being eaten by the trout. I first cast to a shallow run (if you could call it a run, it was so small) and on the second cast the line hesitated. 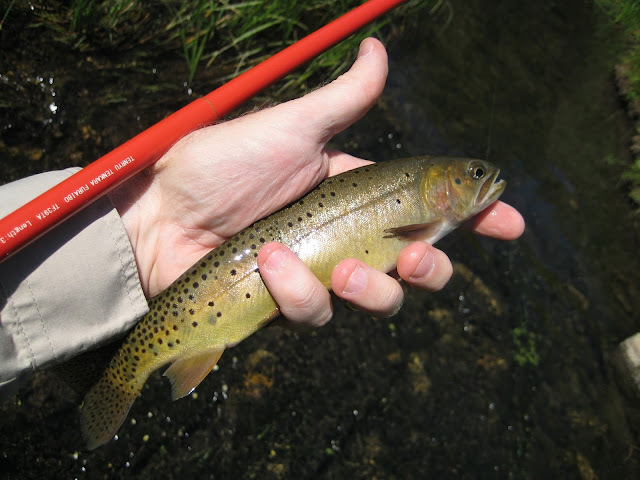 I lifted the rod tip and set the hook into a small, but beautiful cutthroat. I brought him to hand, took his picture and then let him go. Over the next 30 minutes I caught and released eight other cutthroats. None were very large, but that didn't matter. It was just good to be back in the mountains and fishing. I fished for exactly one hour; it was all I needed. I know that I shouldn't be on the stream at this point, but I just had to go! I walked carefully back to the truck and then drove home. It was very good to be back in the mountains again. Glad you were able to get out and let nature assist in your recovery and healing. Thank for sharing. Tenkaratalk.com did a piece on this rod as well, just in case you haven't seen it....Karl. Rod, I use weighted flies frequently. On this day, however, the water was too shallow, so I used an unweighted fly.